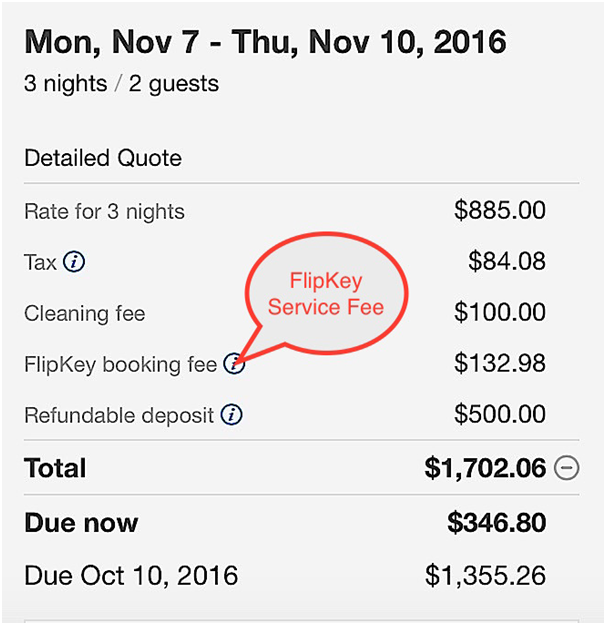 Attention all fellow Travelers, did you know – vacation rental websites are charging an extra-added “booking fee” from travelers! And its not pennies, considering the ‘hidden’ nature of this ridiculous charge. This extra “booking fees” can be upwards of $400, and in some cases even higher. Unfortunately, travelers everywhere have been unaware and grossly misinformed about these extra service charges. Simply because these charges are already included into the finalized rental rates, as advertised by the owner and managers on property listings. So, if you’re wondering that you’ll be getting something in return for the extra fee you pay? Well, Absolutely Nothing! What And When – Back In February 2016, a new travelers’ ‘Service Fee’ was introduced by HomeAway and VRBO that charges for bookings made through their websites. According to company officials, the service fees ranges in-between 4% and 9% of the rental amount and other fees charged (cleaning fees, etc.). A further raise in the service rate was registered by 5% to 15%, and the final figure may end up costing you as much as 20% of the rental rate! The fees also goes by a few different names, such as “booking fee”, “traveler fee” or “service fee.” The wrongful inclusion all of these fees has inflated the natural price of booking a vacation rental. PerfectStayz allows you to book without paying any extra service fees, and directly with the owner! To illustrate an example – Suppose the rental rate is $3,000. An additional $400 in fees for cleaning, linens, pet fees, etc. is also charged. Now the Service Fee will be based on $3,400, and in the range of 5%-10%. You’re a Traveller and are looking to Avoid the Fees – Book directly with the owner or find listing sites that do not charge this service fees. Proactive homeowners have also started listing their properties on many different vacation rental platforms and personal sites alongwith facebook pages, social media profiles of their properties that are duly accessible from search engines. PerfectStayz has the largest and most acclaimed vacation rental properties on its listings, so you can book directly from here without having to pay any additional fees. Chaos Prevails: It gets pretty confusing whilst booking a rental with the service fee inclusion. Travelers usually perceive it as a cost from the homeowners end. And the owners are at most of the time not even remotely aware of this. And it all gets worse when both parties share a dialogue over it. Remember this, your best friend while renting a property is PerfectStayz that allows you to book directly with the property owner or managers themselves. All travelers are requested to respect their livelihood as they respect yours in search of cheaper avenues of booking, hence listing their vacation rental properties on PerfectStayz for cheaper booking prices. If you’re thinking of booking from other vacation rental sites such as VRBO and Homeaway, we request you to refrain from asking them for absorbing the service fees (i.e. asking them to bear the burden), as the owners also shell hefty amounts either for subscriptions or for the pay-per-booking model. Plus, savvy travelers are aware that the best prices comes from booking direct with PerfectStayz, whether it’s a short-term rental, a beautiful yacht or beach-log cabin in the mountains. PerfectStayz.com for every kind of vacation rental bookings, for all seasons and every pricing, and we do this without any intermediaries and in a cost-effective manner.